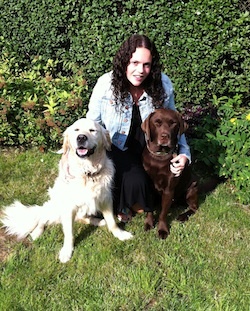 Paws 4 Thought is run by experienced and qualified dog trainer and behaviourist Claire Sayles (BScHons, DipCABT), and can provide you and your dog with a range of services. Claire has loved dogs since she was a child, having owned her first dog at the age of 10. She studied at Goldsmiths College, University of London, and wrote her dissertation on “The effects of Pets As Therapy on People’s mood States.” Her findings indicated that dogs do have a positive effect on people’s mood. If you are interested in reading the research in full,Click Here. Claire continues to be interested in Pets as Therapy. Claire has also studied with the Centre Of Applied Pet Ethology to obtain an advanced diploma in Companion Animal Behaviour and Training. Following this she worked at Hearing Dogs for Deaf People, training assistance dogs. This involved advanced training with a wide variety of dogs. Paws 4 Thought offer the following pet services: Puppy and Dog training classes, 1-2-1 Training, and Dog Day Care. Serving Berkshire, Buckinghamshire and parts of Oxfordshire including: Maidenhead, Marlow, Bourne End, Cookham, High Wycombe and Henley On-Thames. Call us today for more information on the services we can provide.